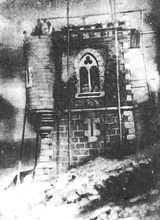 Jean Brunelin represents 40 years of research into the mystery of Rennes-le-Château. Nicknamed 'the Admiral', he has been its court photographer for just as long. From the famous picture of Jean Cocteau on his death bed to the amazing miniatures he discovered in the Bas Relief of Saunière's church. They're all in his phenomenal photo archive. Jean published about Rennes-le-Château in several best selling books. In this album Jean shares some of the more iconic images from the Mystery's past. Historical photo archive from the time of Father Saunière until the early 1960s.